We are glad to announce the release of 2013.09 CarteBlanche Ukraine map version for CarteBlanche Navigator, iGO 8 and iGO Primo applications! The total road network coverage is increased by 8 400 km and constitutes 470 300 km. 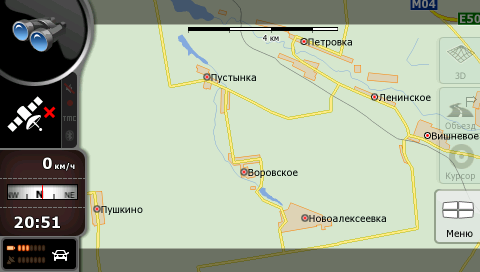 Zaporiz'ka oblast': Orikhiv, Polohy, Vasylivka, Mykhailivka, Novomykolaivka, Pryshyb, Preobrazhenka. The total street network coverage is increased by 1.0% and now constitutes 52.2% by population. Address search covers 45.6% by population. In the cities of Yalta, Masandra, Livadiia and Vyshhorod street networks and address databases are substantially updated. 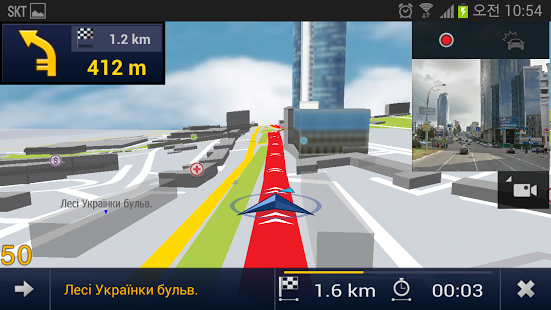 New Navigation App with CarteBlanche Map of Ukraine! We are glad to announce the release of a new Android navigation app E2M by EZGO, incorporating CarteBlanche map of Ukraine! E2M is an outstanding app for drivers with lots of convenient functions, including turn-by-turn navigation and black box recording. It does not only provide voice guidance along the route, but also records video as you drive, so that you can be confident in your safety from road fraud. The app includes a driving mode as well as a pedestrian one. It is capable of calculating several route versions via the given points, which are easy to compare. You can also change the current route quickly and easily when driving, in order to avoid a traffic jam or another obstacle. The app incorporates the newest CarteBlanche Ukraine map 2013.06, including a detailed coverage of 790 settlements in Ukraine. The map is displayed in full 3D view and supports speed limitations and lane information. Classic interface and bright design will be convenient for both novice and experienced users. The app is already available at Google Play for Android 4.0 and later devices, and offers a 2-week free trial! EZGO Company is a technology leading company in GPS Navigation application industry with a high level of experience in developing under mobile device environments. Founded in 2008 with a strong mobile industry background, the company has an unparalleled track of creative innovation and effective technical leadership. EZGO is a navigation software supplier for Windows CE devices and smartphones with the coverage for Brazil, Malaysia, Singapore, Russia, Ukraine, Iran, Turkey, Australia/New Zealand and China. An updated version of Mireo DON'T PANIC 4.7.4 with CarteBlanche Ukraine map 2013.06 is available on Play Store. The update is free for all legal users. Price Reduced for All Navigation Software for Windows CE! We are glad to announce price reduction for navigation software with CarteBlanche Ukraine map for Windows CE devices! From now on, the price on Mireo DON’T PANICwill be reduced to 350 UAH, and the price on CarteBlanche NAVIGATOR (based on iGO8) will be reduced to 390 UAH. Both applications include the newest map of Ukraine with a detailed coverage of 749 settlements and over 460 000 km of roads. Hurry and purchase quality navigation for a bargain price! We are glad to announce that the 2013.03 version of Carte Blanche Ukraine NT map is now available for Garmin® and Kenwood® navigation devices! The total road network coverage is increased by 3 900 km. Zaporiz'ka oblast', Vil'nians'kyi raion: Vil'nians'k, Kam'iane, Antonivka, Bekarivka, Biliaivka, Bohdanivka, Bohatyrivka, Chapaievka, Dniprovka, Druzheliubivka, Hnarovs'ke, Hrushivka, Kirovs'ke, Kolos, Kozakivs'ke, Kozache, Kruhlyk, Krutyi Yar, Krynychne, Kupriianivka, Liutserna, Maksymivka, Matviivka, Moskovka, Mykhailivka, Nahirne, Novosofiivka, Novotroits'ke, Novofedorivka, Novohupalivka, Novoivanivs'ke, Orlivs'ke, Pavlivs'ke, Perun, Petro-Mykhailivka, Pryvil'ne, Spasivka, Tersianka, Troiandy, Trudoliubivka, Ukrainka, Ulianivka, Ural's'ke, Vasyl'kivs'ke, Volodymyrivka, Vyshneve, Yakovleve, Yasynuvate, Zelenyi Hai. The total street network coverage is increased by 0.9% and now constitutes 51.2% by population. Address search covers 44.7% by population. In the citiy of Mariupol' street networks and address databases are substantially updated. Interconnecting roads in Odes'ka region are updated. Number of POIs is increased to about 77 440. Added support of Russian as a 3rd language. Therefore, now CarteBlanche Ukraine map 2013.03 contains a detailed coverage of 749 settlements (51.2% of the Ukrainian population), including 147 cities; almost all of this coverage (44.7% of population) includes address search. The map features a detailed coverage of all settlements in 9 districts of Kyivs'ka oblast' (Bilotserkivs'kyi, Boryspil's'kyi, Brovars'kyi, Kaharlyts'kyi, Kyievo-Sviatoshyns'kyi, Obukhivs'kyi, Pereiaslav-Kmel'nyts’kyi and Vasyl'kivs'kyi), in-block passages in many cities. The total length of road coverage is 461 900 km, including a large number of unpaved roads. Many thanks to Barannik S. V., the President of Zaporiz'ka regional non-governmental organization 'Association of Ambulance Workers', for the information on Zaporiz'ka oblas't. We are glad to announce that the 2013.03 version of CarteBlanche Ukraine map is released for Mireo DON'T PANIC for Windows CE! An updated version of Mireo DON'T PANIC 4.7.3 with CarteBlanche Ukraine map 2013.03 is available on Play Store. The update is free for all legal users. We are glad to announce the release of CarteBlanche Ukraine 2013.03 map version for CarteBlanche Navigator, iGO 8 and iGO Primo! The total road network coverage is increased by 12 600 km. Street networks and address databases in the cities of Dnipropetrovs'k and Zaporizhzhia are substantially updated. Detailed coverage of in-block passages is added, based on the recent data of our unique GPS/video survey. In the cities of Kyiv, Ternopil', Vinnytsia and Mariupol' street networks and address databases are substantially updated. The total street network coverage is increased by 1.8% and now constitutes 51.2% by population. Address search covers 44.7% by population. Building footprints are added for 6 cities: Ternopil', Kosiv, Sverdlovs'k, Svitlovods'k, Zhovti Vody, and Zvenyhorodka. Building elevations (3D) are added for 8 settlements: Ternopil', Kosiv, Mariupol', Staryi Krym, Sverdlovs'k, Svitlovods'k, Zhovti Vody and Zvenyhorodka. Interconnecting roads in Chernivets'ka, L'vivs'ka, Odes'ka and Poltavs'ka regions are updated. Support of the Russian language is added. Mireo DON’T PANIC navigation app with CarteBlanche map of Ukraine has become available for iPhone! Buy the app from iTunes and start using simple and convenient navigation. As all DON’T PANIC versions, DON’T PANIC iPhone boasts an intuitive user interface as well as quick and stable performance. One of the best software features is the Search page, which supports search for any addresses or POIs in one line. Graphics is optimized for Apple Retina display in order to get the most out of your iPhone. The package includes a highly detailed map of Ukraine, which will be regularly updated free of charge. Maps of other countries are also available for purchase. Price on Mireo DON’T PANIC Ukraine permanently reduced! We are glad to announce that the price on Mireo DON’T PANIC Ukraine for Android is permanently reduced! If you haven’t taken advantage of our spring special offer, you can still purchase the navigation software with the map of Ukraine for only 175 UAH. The price includes regular map updates! The reduced price is valid for the activation codes for the map of Ukraine, which are available for purchase in our office, in 24nonStop payment terminals, in PrivatBank network or via Privat24. Try before you buy – you can install DON’T PANIC on your Android device free of charge from Google Play Store and download a 7-day trial map of Ukraine from the in-app store. From now on, CarteBlanche Ukraine map for Mireo DON’T PANIC (Android) will be updated free of charge without any time limitations! We try to make the use of our navigation solutions as convenient and pleasant as possible. That is why, together with Mireo Company, we have decided to provide free updates for the map of Ukraine not only within 1 year from the purchase date, but later on as well. New versions of Mireo DON’T PANIC app and CarteBlanche map are released up to 4 times a year. The app can be updated via Google Play, while the map of Ukraine can be downloaded free of charge from the in-app store. At the moment Mireo DON’T PANIC version 4.7.2 with the most recent map of Ukraine is available on Google Play Store. If you are using an older app or map version, do not forget to update your navigation! 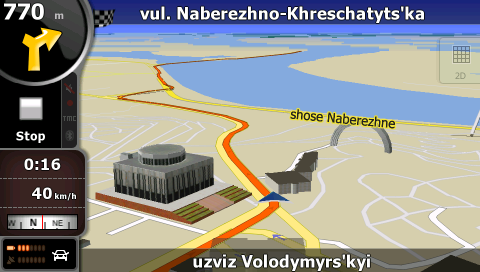 An updated version of Mireo DON'T PANIC 4.7.2 with CarteBlanche Ukraine map 2012.12 is available on Play Store. The total road network coverage is increased by 2 800 km. The total street network coverage is increased by 0.3% and now constitutes 50.3% by population. Address search covers 44.1% by population. Street network and address database in the city of Zaporizhzhia are substantially updated. Detailed coverage of in-block passages is added, based on the recent data of our unique GPS/video survey. In the cities of Kyiv and Vinnytsia street networks and address databases are substantially updated. Interconnecting roads in Poltavs'ka region are updated. Number of POIs is increased to about 77 200. Therefore, now CarteBlanche Ukraine map 2012.12 contains a detailed coverage of 689 settlements (50.3% of the Ukrainian population), including 139 cities; almost all of this coverage (44.1% of population) includes address search. The map features a detailed coverage of all settlements in 9 districts of Kyivs'ka oblast' (Bilotserkivs'kyi, Boryspil's'kyi, Brovars'kyi, Kaharlyts'kyi, Kyievo-Sviatoshyns'kyi, Obukhivs'kyi, Pereiaslav-Kmel'nyts’kyi and Vasyl'kivs'kyi), in-block passages in many cities. The total length of road coverage is 458 000 km, including a large number of unpaved roads. We are glad to announce that the 2012.12 version of Carte Blanche Ukraine NT map is now available for Garmin® and Kenwood® navigation devices! Special Offer: Mireo DON’T PANIC Ukraine for 175 UAH only! The long winter is finally over – it is time to get ready for summer and for new exciting trips! We would like to make a special spring gift for you, which will make your journeys easier and more pleasant: a 30% discount for the map of Ukraine for Mireo DON’T PANIC (Android OS) navigation software. To use your discount, install Mireo DON’T PANIC onto your Android smartphone or tablet from Google Play (the installation is free of charge) and purchase the map of Ukraine activation code in our office, in PrivatBank network or via Privat24. From the 11th of April till the 15th of May the price of the map is only 175 UAH! We are glad to announce that the 2012.09 version of CarteBlanche Ukraine map is released for Mireo DON'T PANIC for Windows CE! The total road network coverage is increased by 8 600 km. The total street network coverage is increased by 1.3% and now constitutes 50.0% by population. Address search covers 43.7% by population. Street networks and address databases in cities of Kharkiv and Dnipropetrovsk are substantially updated. Detailed coverage of in-block passages is added, based on the recent data of our unique GPS/video survey. In the city of Ternopil' building footprints with numbers are added, street network and address database are substantially updated. Updated street network for the city of Kyiv. Interconnecting roads in Lvivs'ka and Chernivets'ka regions are updated. Number of POIs is increased to about 75 800. Therefore, now CarteBlanche Ukraine 2012.09 contains a detailed coverage of 686 settlements (50.0% of the Ukrainian population), including 137 cities; almost all of this coverage (43.7% of population) includes address search. The map features a detailed coverage of all settlements in 9 districts of Kyivs'ka oblast' (Bilotserkivs'kyi, Boryspil's'kyi, Brovars'kyi, Kaharlyts'kyi, Kyievo-Sviatoshyns'kyi, Obukhivs'kyi, Pereiaslav-Kmel'nyts’kyi and Vasyl'kivs'kyi), in-block passages in many cities. The total length of road coverage is 455 200 km, including a large number of unpaved roads. We are glad to announce that the 2012.09 version of Carte Blanche Ukraine NT map is now available for Garmin® and Kenwood® navigation devices! The total road network coverage is increased by 5 900 km. The total street network coverage is increased by 0.6% and now constitutes 50.0% by population. Address search covers 43.7% by population. Street network and address database in the city of Dnipropetrovsk are substantially updated. Detailed coverage of in-block passages is added, based on the recent data of our unique GPS/video survey. An updated version of Mireo DON'T PANIC with CarteBlanche Ukraine map 2012.09 is available on Play Store.